The Association of Pet Obesity Prevention advises that pets are suffering from epidemic obesity and it is preventable. Obese or overweight animals weigh in at nearly sixty-percent for cats and nearly fifty-percent for dogs. The number is constantly increasing and causing health conditions and physical distress for household animals. "Helping your pet maintain a healthy weight is crucial to their quality and length of life," says veterinary nutritionist Edward Moser. 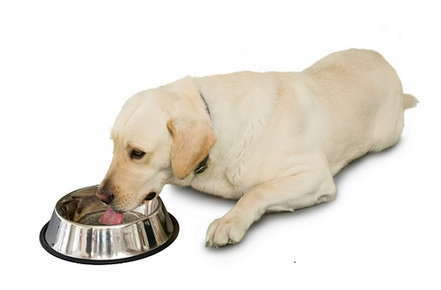 "In fact, studies show that limiting your dog's caloric intake could extend his life." Food Is Not Affection advises of the importance of pet owners distinguishing the difference between food and affection. "Owners tend to give their pets food and treats as a way of showing affection, but this habit can backfire if it isn't practiced with some restraint. Far better to give your dog a good snuggle than a leftover from the dinner table." Stacia Willson's Consistency, Patience Crucial to Helping Pets Maintain Healthy Weight discusses her conversation with Cathy McCoy, Humane Society of San Antonio's public relations director. McCoy educates and urges the public that, "Giving leftover table scraps is another fault that can potentially hurt your pet. Keeping track of their weight weekly and developing the proper moderate exercise technique safe for your pet is essential." Those moderate exercise techniques McCoy suggests include daily walks with your pet, playing catch with size/breed specific toys, tossing and fetching toys appropriate size toys, and swimming. These are "great ways for animals to build stamina, strengthen their legs and lose weight," McCoy advises. How to Help Your Pet Maintain a Healthy Weight educates pet owners about health conditions that become consequences of pet obesity and lack of weight management. "Pets that are overweight or obese are at risk for osteoarthritis, type 2 diabetes, respiratory disorders, high blood pressure, heart disease and some forms of cancer." Increasing numbers of "pets are developing these disorders as a direct result of obesity." Leary, the author, urges owners to help their pets maintain healthy weights and implement weight management techniques because "these conditions are usually preventable, but once they develop, can be chronic and incurable." Obesity and lack of weight management in your pet's life can cause havoc with their immune systems and make them prone to disease, virus and illness. Other consequences of excess pet weight or obesity in dogs and cats include damage to the skeletal structure leading to arthritis. At least one-quarter of household dogs are estimated to suffer from joint conditions that are serious. Ramifications of overfeeding and underexercising your pet also include intestinal disturbances, excessive tummy gas and digestive disorders. Pet Weight Loss by veterinarian Jan Becker discusses pet exercise for owners of cats and dogs. Dr. Becker suggests that walking, jogging or riding your bicycle with your dog can work well for both of you, and that tossing balls and Frisbees can keep your pet moving if it enjoys chasing a flying Frisbee or a favorite ball. Care must be given to treadmill exercising for your pets because it can be dangerous and cause injure to them during the learning process. "Cats on the other hand can be a bit harder to exercise," says Dr. Becker. Get your cat moving with cold laser lights flashed onto objects to interest them - but not in their eyes. Wiggle stuffed animals, move them sneakily to get your cat's interest and increase the attraction of pouncing, sneaking, hiding or batting at the soft toy. Owners must be vigilant of string products or toys. The string can easily get caught or tangles with your cat's tongue inducing them to swallow it. Unfortunately, when this happens it can be "very serious or even fatal." "Catnip will often get a cat running around," says Dr. Becker. Keep in mind that catnip must be used in moderation. For cats, the nip is a stimulant that can cause digestive upsets."